Reports are typically presented as an S-Curve Report, which gives your project stakeholders a clear visual report showing how your project is trending. Earned Value Management improves communication, reduces project risk and provides better forecasting, progress tracking and project visibility. It is the industry standard method of tracking project progress on capital projects. This 1-Page summary in our Project Controls series gives you a downloadable quick Reference Guide on the fundamentals of earned value analysis including a EVM cheat sheet of the abbreviations, definitions and EVM calculations required to show your stakeholders your project’s current earned value, cost performance index (CPI) and schedule performance index (SPI). Your project plan will include your project’s scope, schedule, and costs. Project plans may also include resource loading and a quality plan. Project Managers use tools like Oracle Primavera P6 or Microsoft Project to create their resource-loaded project schedule (or they simply use an Excel spreadsheet to organize their project – though managing projects in Excel can quickly become a headache). Project Managers will also integrate these tools with other software packages during work execution for daily progress tracking, delay tracking and timesheets. The project will have a budget that needs to be aligned to the completion of Activities which is the scope of the project. Your project plan will need to show that you plan to have X Activities Done by Y Date and it will cost you $MM. $5MM is your Budget at Completion (BAC) and the starting point for your Earned Value Management. Not all activities in your scope are created equal. You need to decide how you will measure when an activity in your scope is completed and how that will credit your overall percent complete on the project. Whichever progressing method you decide to use you need to know how much work you’ve done on the project at any given point, what it has actually cost you to get that work done and what you had planned to spend to get that same amount of work done. Of course the more field data you have the better you can understand the factors impacting your project delivery and develop plans for mitigating the risks to your project objectives in terms of schedule and cost performance. 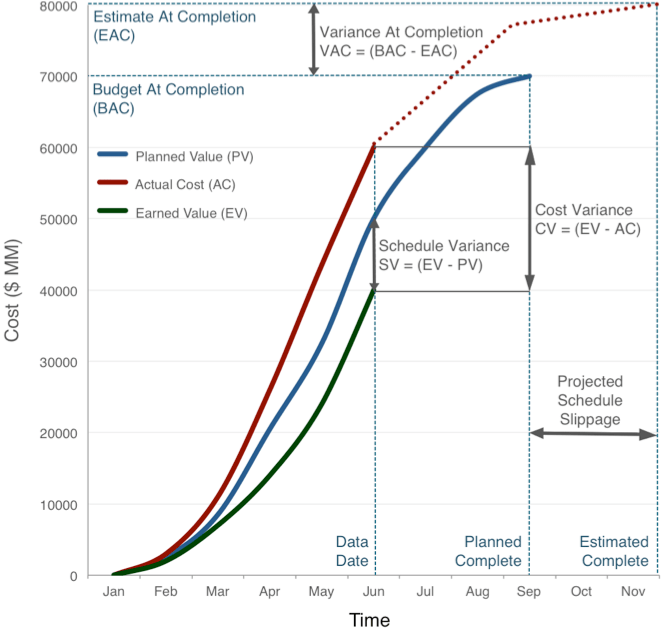 EAC is your Estimate at Completion and is explained below. A value greater than 1 is typically good (it indicates your cost to date is less than planned) and a value less than 1 is typically bad (it indicates your cost to date is more than planned). A value of 1 indicates you are on plan. A value greater than 1 is typically good (it indicates your are ahead of schedule vs. plan) and a value less than 1 is typically bad (it indicates you are behind schedule vs. plan). A value of 1 indicate you are on plan. This is the expected cost to finish the remaining work. You’ve calculated your earned value, your cost performance index and schedule performance index, and your forecasts for Estimate at Completion (EAC) and Estimate to Complete (ETC). The next step is to take this data and make it visually presentable to project stakeholders – this is done using an S-Curve report. When is this project data as of? When do we expect to finish? And for simplicity we’ll assume the project spend rate is the same each month until completion. At month 5 your personnel in the field are reporting that you are 40% complete on the project and you’ve spent $3MM. What does your Earned Value look like? This covers the basic concept of Earned Value Management (EVM), S-Curve reports and how to work through the calculations with a simplified example. In practice project plans are much more complex and may require more nuanced indicators of your project’s performance. Download the Earned Value Management Reference Guide, print it off and take it with you so that you always have at your fingertips a quick reminder as to how earned value is calculated when reviewing your project progress. Learn how you to improve your progress tracking and delay reports using Industrial Audit’s secure mobile field data collection software and get started today! Click to download the free reference! Share this Efficiency Note with your colleagues!